Before going shopping for sure every bride has in mind lots of dresses seen so far. As a general idea they look on catalogues or imagine themselves wearing a specific dress. But surprise, the reality may not correspond with the envisioned outfit. And if we are speaking about petite brides things are more complicated. Petite wedding gowns are a category with lots of options so you don’t have to worry about this, considering that your statue height is a factor limiting your selection. 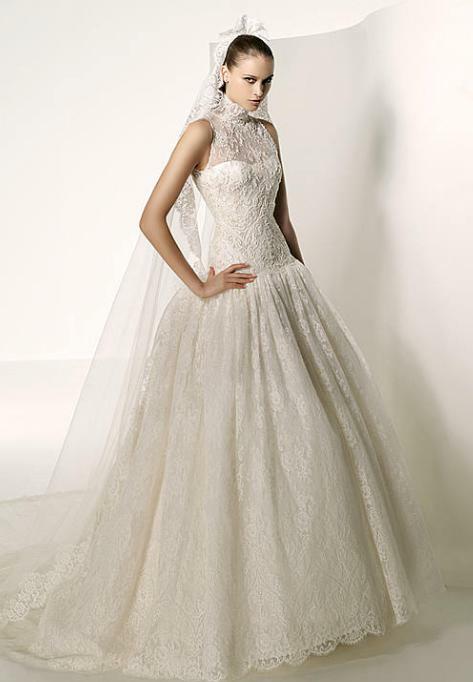 It is just the brides needing to know exactly what they should choose, the inconveniences about certain cuts of dresses. Is not that you can change the height but it is about avoiding not to accentuate this or worse create the impression of even lower height. Excluded dropped waist patterns, as well as mermaid ones. With no waist line accentuated where it should be the bride ill look as a dwarf, shorter legs. These are mostly for tall ones. You need the exact opposite, empire waist cut. Exclude or limit the accent on enmeshments. For a so small surface to add beads and shiny, sparkling details, sash and tulle at the skirt it is just too much. The top part should be more uncovered, shoulders at sight, sleeveless, strapless. But don’t exaggerate into making this the focal point since you are the petite bride. Many have this as a complex and they find substitute with a deep cleavage, with a short dress and so on. Avoid too puffy, bouffant skirts like ruffled and with tulle ones as they will make you look like a Christmas tree, short and full decked out.